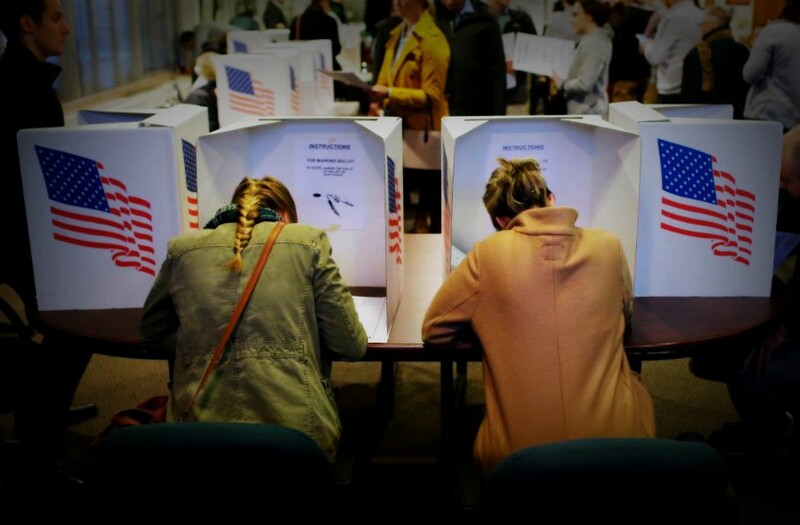 On Tuesday, November 6, the highly anticipated midterm elections took place. In the end, the Democrats took back control of the House of Representatives by obtaining a majority number of seats in the chamber, while Republicans retained control of the Senate by making significant gains in their Senate seat majority. The end result of these midterm elections sets up a divided government in Congress, which will mean that more partisanship and gridlock among Democrats and Republicans, likely occurring until the next presidential election in 2020. There are still a few races to be called, but as of right now the Democrats have a total of 225 to 197 Republican seats in the House of Representatives. The Republicans, meanwhile, have a 51 to 46 seat majority in the Senate. These numbers could change since key races in both chambers are still undecided, including those in Florida and Mississippi. Historically, the midterm elections are about how well the president, and the majority party in Congress, are doing in the lead up to the elections. Normally, the party in power loses seats in Congress, which in this case, the GOP lost a lot of seats in the House. The midterm elections also gave voters a chance to examine how well President Trump and the Republicans are running the country after two years in office and power. The country seems divided on whether Trump and the GOP are running the country well, based on the results of the midterms. The vendetta of the midterms is the results of it good for the country? We looked at six congressional races, one House race, one Senate race, and tried to figure out the political implications of the winning candidate and their party, in each race. Fellow PVNN writers David Williams and Scott Kim contributed to the coverage of these races with me. This in of the most important races in the midterm elections for Republicans in their battle for retaining control in the U.S. Senate. Heitkamp was first elected to this seat in 2012, only winning by one percentage point, a state President Trump won in 2016 by 36 points. Heitkamp was North Dakota’s Attorney General, from 1993 to 2000, while also serving as the attorney for the Environmental Protection Agency, and director for a synfuels plantn based in North Dakota. Her opponent, Kevin Cramer, represented North Dakota in the House of Representatives. Cramer served in former North Dakota Republican Governor Ed Schafer’s administration from 1993 to 1997, as the state tourism director. He was also the state economic development and finance director from 1997 to 2000. Cramer ended up winning the race by 11 points, with a 178,876 to 143,737 vote victory. The race gained national attention since the winning candidate could possibly shift the balance of power in the U.S. Senate. Cramer’s win served as an added plus for the GOP after they reattained their control of the Senate. The reason I believe Heitkamp ended up losing this race was due to her being a Democrat who adopted moderate positions on key issues in an electorally Republican state in North Dakota. Another reason why I believe Heitkamp lost was that she ended up voting against now Justice Brett Kavanaugh in his nomination process, due to his demeanor during his now infamous testimony in the case of him versus Christine Blasey Ford. My hunch is that voters in North Dakota didn’t agree with her accusations. This race sought to fill an open seat left by outgoing Democrat Representative Tim Walzt. The outcome of this race weighed serious implications on who could control the the House of Representatives. Dan Feehan was an Army ROTC, who enlisted after the September 11 terror attacks. Feehan served in two combat tours of duty, as part of the Operation Iraqi Freedom military mission. Feehan also served in the Obama administration as a White House fellow, and was the assistant secretary of defense in the Pentagon. His opponent, Jim Hagedorn, was a legislative assistant to former Republican Representative Arlan Strangeland from 1991 to 1998. Hagedorn was also the congressional liaison for the Financial Management Service. Hagedorn won the race by having 50.1% of the vote, compared to Feehan’s 49.7%. The difference of the votes was 1,311. Hagedorn ran for this seat in 2016, and before that in 2014 and lost both times, this time, however, he was able to win this seat. This race was widely seen as one of the key races for control of the House. Both candidates raised more than $5 million in fundraising for this race, while outside groups spent about $12.8 million on the race, according to an estimate by the nonprofit investigative journalism group ProPublica. This fundraising data just shows how important this race was to both political parties. I believe the results of the midterm elections isn’t good for the country in the long run. While having more women and diversity in Congress is no doubt a good thing, I think the fact, come Janueary, we’ll continue having a divided Congress will make it difficult for lawmakers to get things done. It’s no question that the country has been polarized and divided for the last two years up until this point, but I predict that the country will be even more divided in the next couple of years, as a result of these midterms. Some say that the recent polarization can be contributed to President Trump’s divisive leadership style, and oftentimes hard-line politics. Some of the blame can go to lawmakers in both parties, by not working together to get things done. Whatever the case, I think the partisanship of Congress and the polarization of the country will be too toxic for America in the long run.